I have received from my niece your letter to her (in which you say you wd like to undertake the situation of sec[retary]. to Mr D[arwin]. In an undated and incomplete draft letter to a “Miss I.”, Emma Darwin appears to be arranging for Miss I. to come to Down for a trial period as a secretary. When the letter first came to light, no one had heard of the mysterious “Miss I.” and, as far as we knew, Darwin never employed a secretary. Members of his family acted as his amanuenses, read to him, helped with experiments, and read drafts of his work; from time to time he employed someone to make fair copies of his manuscripts. His children’s German governess helped with translations, even after she had left the family. This is the first evidence that a formal post was even considered. A second letter in the Darwin Archive–CUL (DAR 219.9: 95), helped to date the draft and identify Miss I.
Mr Powell [the vicar of Down] v. goodnaturedly hunted all the village for lodging for Miss Isitt, & nobody will have her but Mrs Martin, they all say that they do not like to undertake a young lady they require so m[uch]. attendance. But that is an affair of money so I don’t despair of their changing their minds F[ather]. is going to prepare some straightforward dictation for her so that he may not be m. frightened. We send for her to Croydon. Her last Mrs [mistress] is a Mrs Jesse (late Miss Tennyson who was to have married Arthur Hallam) I dare say R [Richard Buckley Litchfield, Henrietta’s new husband] knows her. . . . We put Miss Isitt into No 4 for the present. After a time I shall turn her out & shall enjoy making it nice & comf[ortable]. for you. We are greatly puzzled where to establish her, but I think whichever bedroom we give her as sitting room we must put up a bell from the study. We have many schemes, one is taking 1/2 the tool room. . . . I am going down this m[ornin]g to see if I can soften any one’s heart to take in Miss I. Some persistent Googling enabled us to track down a possible Miss Isitt: a Virginia Lavinia Isitt who was headmistress of the Port Elizabeth Collegiate School in South Africa from 1874 to 1886. 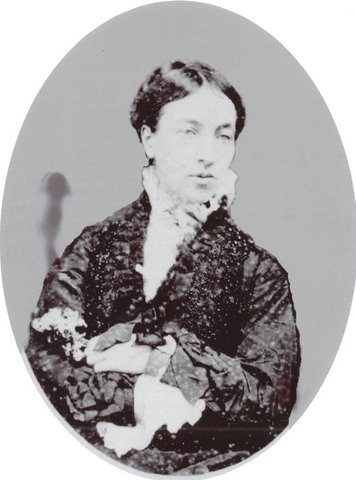 The fuller name led us to a descendant of the Isitt family, Dr Paul Newbury, who confirmed that Virginia Lavinia Isitt had been both governess to the son of Tennyson’s sister, Emily Jesse, and headmistress at the Port Elizabeth Collegiate School; he had been unaware of the Darwin connection. Additionally, he told us that between 1862 and 1863 Miss Isitt had studied for a French State Certificate in education at the Convent College in Arras. In 1871, Darwin was receiving letters relating to his latest publication, The descent of man, and working on his next, The expression of the emotions in man and animals. His daughter Henrietta, one of his amanuenses, had recently married. So, it is possible that he and Emma were more than usually receptive to the idea of a secretary. The niece that Emma mentions in her draft letter to Miss Isitt was probably Julia (Snow) Wedgwood, who had a number of literary connections and probably met Tennyson. The Darwins themselves had met Tennyson on the Isle of Wight in 1868. Reading between the lines, it seems that Miss Isitt was using her connections to try to support herself while she searched for openings into a more congenial career in schoolteaching: and supporting oneself was by no means an easy task for an unmarried Victorian woman. Clearly the Darwins viewed the prospect of welcoming a stranger into their home with some trepidation, and were certainly “puzzled” how best to organise this novel situation. There is no further mention of Virigina Isitt in Darwin’s correspondence, nor has anything further been found in the Darwin Archive–CUL. So, sadly, we don’t know how the experiment worked out. According to Emma Darwin’s diary, Miss Isitt arrived on 18 September and left on 20 September: perhaps never to return. Virginia’s vocation evidently lay in teaching, and not many years later she became headmistress at Port Elizabeth. It would be pleasant to think that the Darwins used their influence to further her career, as Darwin had helped the gardener John Scott, but we just don’t know. Possibly Darwin’s intense desire for privacy made the trial unsuccessful. According to Dr Newbury, there are three photographs of Darwin in Virginia Isitt’s photograph albums, which suggests some admiration or fond memories. Feels it unlikely that CD could employ a secretary but he is prepared to experiment if Miss I. would care to come to Down for a period. Teacher. Governess to the children of Emily Jesse, Alfred Tennyson’s sister. Studied for the French State Certificate in teaching at the Convent College in Arras, France, 1862–4. First headmistress of the Port Elizabeth Collegiate School for girls, in South Africa, 1874–86. An example of some editorial sleuthing. However well studied Darwin’s life may be, new things are still waiting to come to light!